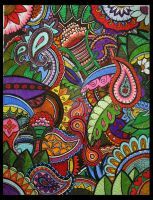 - It is a reproduction of my original painting titled "Rainbow Flower"
- Copyright won't appear on your print. - Items are shipped sealed in a secured handmade enclosure. Copyright © Sara Yard. All rights reserved. My images may not be reproduced in any form without my written permission. I really love this kind of work! Oh my gosh this is brilliant... great job... I LOVE IT!! Very pretty and refined !!! Lovely colours !!! This is cool I like it and it is different. Great colours! & beautiful shading too. this is so beautiful! you've got nice-colour sense! Wow, I really love this. Gorgeous! Ohhhh I love this. Its so colorful..